Written by admin on November 8th, 2014 . Taking rest after blazing and rerouting with friends. 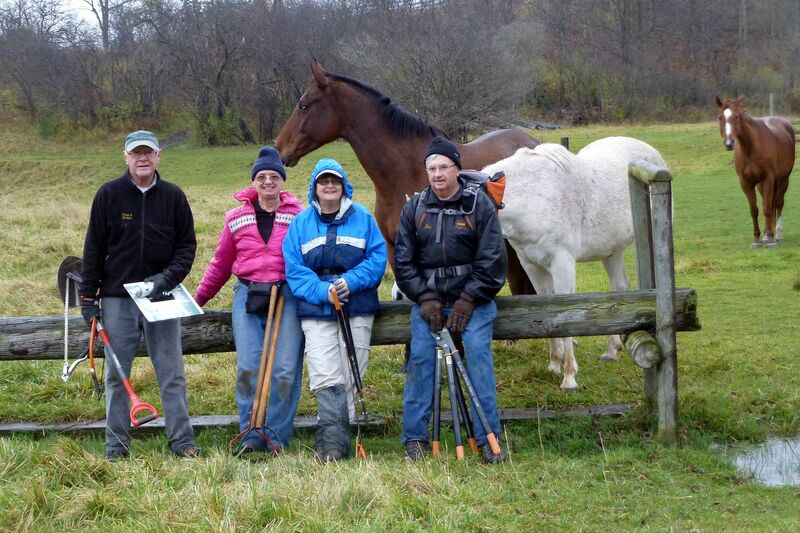 The weather was a little colder than we would like yet 5 hardy volunteers participated in a reroute around wash out area west of the horse farm. New blazes were added from the east end of horse farm marking the gates all the way to washout and reroute. The horse farm is one of those rare places where hikers are required to open and close gates to get across. It was a very scenic day out with all the fall colours on the ground. Thanks to Brian K our treasurer who blazed the trail and helped create a safe way across the water. Two other volunteers, Tom and Mark removed fallen trees off a bridge near Fulton Bridge Line and assessed repair needs and possible ways to prevent it from happening again. That might be a tall order with the estimate of 90 percent of all ash trees in Ontario being killed by the emerald ash borer. Thanks to everyone who gave up their Saturday morning to improve the trail for all users. Kudos.